When pure Gasteiner water is mixed with a hint of natural fruitiness, Gasteiner packs extraordinarily refreshing taste into every sip. 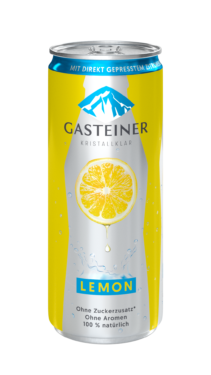 Gasteiner Lemon, Grapefruit and Orange focus on the pure flavour of freshly squeezed fruit juice – 100% natural refreshment. 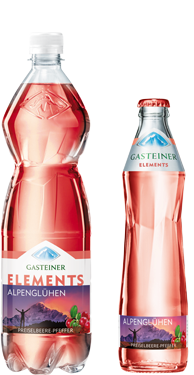 Gasteiner Elements Alpine Glow offers a sparkling fiery mixture of cranberry and pepper. There’s one thing every fruity variation has in common: a complete lack of artificial flavours and added sugar! The first sparkling mineral water on the market with freshly squeezed lemon juice. Pure pleasure - without sugar and flavourings, but with all the fruity sparkle. Also available in a cool 0.33l can - 100% natural refreshment. 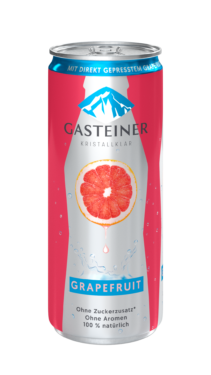 A hint of freshly squeezed grapefruit juice gives sparkling Gasteiner water a distinctive tart fruity flavour. No added sugar or artificial flavourings means the true, refreshing grapefruit taste is preserved - 100% natural refreshment. It’s as if you had splashed some freshly squeezed orange juice into delicious Gasteiner water: This is just how Gasteiner Orange tastes, with its hint of freshly squeezed orange juice lending it refreshingly Mediterranean fruitiness - 100% natural refreshment. For fiery moments: Cranberry juice, hibiscus tea and black pepper to spice up your life.